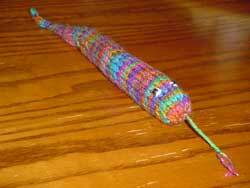 Knitting has been slow, but I made this catnip snake for one of the cats for Christmas and will be making a second for the other fur ball. I have begun work on the website for my new client and I’m starting to feel some creative urges I haven’t felt in ages. I’m so excited about this project and I hope to see a great deal of sucess come of it for both my client and myself. My hope would be by Fall I could stop or a least lessen the childcare load and do the web work full time. My creative self has been negelected too long. Hope you find an agreeable child, one that will cause no stress. That’s a purty snake, your’s is a lucky cat. I did try looking up your house right after I looked up my own. It seems like they skipped right over your address, which was totally confusing. However, I asked your mom on Sunday and she said it was built in 1912–so it was only an empty lot in 1901. Likely one of the houses nearby had double lot. I was dying to know who lived there too! But you can find out in the city directories. next time I go to the library to do more research, I will check it out.